Dubai’s Safa Park, though a little more than half the size of New York’s Central Park, has many things in common with it. It was, for example, built on the site of a shanty town whose inhabitants were removed to make way for it. 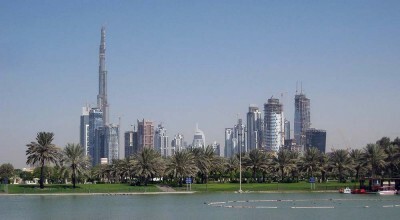 Like Central Park, it is just about in the center of its city and is almost hemmed in by skyscrapers, including the Burj Khalifa, the world’s tallest building. It also sports beautiful greenswards, groves, lakes and is home to hundreds of species of birds and vegetation. One thing that’s different are the many palm trees that grow in Safa Park. Safa Park was first built in 1975 and then renovated over the years. Visitors to the park can often attend a cricket game on a sunny afternoon, or rent a paddle boat to ride around one of the lakes. Sports like tennis and soccer can also be played. The park is also an excellent site for picnics and barbecuing and has cafés for a leisurely cup of coffee. There is plenty to do for people who prefer peace and quiet, even in the midst of a big, gleaming and rapidly expanding metropolis. The park has a reputation for being clean, save for the leaves and flowers that beautifully litter the walkways in the fall. Beside the peacefulness of its ponds and gardens, there’s also an artificial waterfall. Visitors can also climb a gentle hill which gives a view of the park and the city around it. Safa Park can be accessed from Sheikh Zayed and Al Wasl Roads, and Al Hadiqa and 55th Streets. The gates open at 8 AM and close at 11 PM.